The Gira door communication system is unique in concept and design. Because all inserts for the functions speaking, listening and seeing can be integrated in normal flush-mounted boxes, the door communication becomes part of the world of switches. Gira emphasises this integration visually by using existing design platforms. The door station fits into a Gira design line developed especially for outdoor applications. And the home station for indoor use can be integrated in virtually all Gira switch ranges. As a result, Gira offers an enormous variety of design variations suitable for almost any decorating style. They also enable the realisation of various application solutions. For because the Gira door communication system has a modular design, door and home stations can be individually combined, equipped with different functions and easily retrofitted or expanded later. This means it is possible, for example, to easily expand the audio version with the video function at a later time. A particularly attractive version of the Gira home station is the surface-mounted variant with the hands-free feature. The compact device with an overall height of just 19 mm offers the high voice-reproduction quality of modern mobile phones and a clear operating concept. However, most important is the fact that the home station has no receiver that could be torn off or dropped, and no bracket that could be damaged due to careless use. With regard to the design, the surface-mounted variant of the hands-free feature home station can also be integrated in the Gira switch ranges. As a result, a uniform, attractive appearance of the door communication and electrical installation are also guaranteed in this case. The surface-mounted hand-free feature home station can also be installed as an independent base unit without a cover frame from the Gira switch ranges on request. 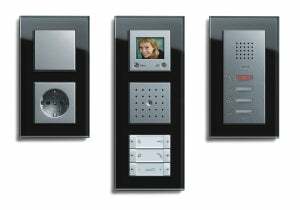 The Gira door communication system was developed in cooperation between the Gira design team in Radevormwald and Phoenix Design in Stuttgart, Germany.